Ahhh… spring. When it finally arrives, everything and everybody springs into action (bad pun intended). Tulips and daffodils start poking their little stems up through the soil, kids rediscover their bicycles and chase each other through the neighborhood, parents don gardening gloves and start cleaning up their yards. What kinds of things do you do for your business when the weather warms ups? 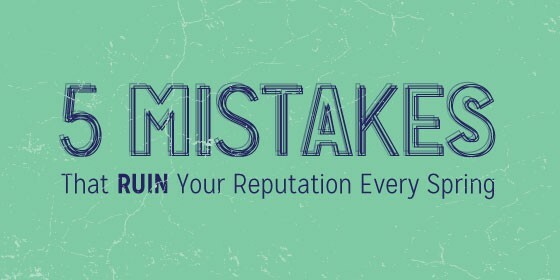 If the answer is, “it’s business as usual,” you might be making 5 mistakes that ruin your reputation. 1) You haven’t cleaned your parking lot. Parking lots look pretty nasty when the snow starts to melt. There’s always a crust of blackened, crusty snow left along the fence line or in that one shady spot that never gets direct sun. It looked bad enough when there was snow on the ground everywhere; now it looks particularly nasty. And the winter detritus that gets uncovered when the snow melts! Plastic shopping bags. Soggy old pizza boxes. One filthy little lost mitten, sitting near the curb in a icky, shapeless blob. This is where people park before getting out of their cars and coming in to give you their money. For many businesses, the parking lot is located right in front. The disgusting, soggy mess in your parking lot is not the kind of welcome your customers want. They’re in a sunshine frame of mind—all ready to buy new spring clothes, patio furniture and yard tools. They don’t want to have to step over that filthy little mitten to enter your business. Get out there with a snow shovel and break up that blackened, crusty snowbank so it will melt this afternoon. Sweep up all the trash and hose off the parking lot if you can. Oh, you say the landlord is responsible for the parking lot? He has a crew that’s supposed to take care of it? Your customers don’t know that. They see your business and the parking lot in front of it and think you’re a slacker. Either call and insist that the landlord send a crew over this afternoon, or get out there yourself. It’s your reputation, after all. 2) You haven’t removed your Christmas decorations. It was so much more fun to put them up in November! Somehow you just can’t find the time and energy to dig out a ladder and take down the tinsel and the “Happy Holidays” banner you installed up near the ceiling. The most generous of customers gave you until the end of January to get your act together. Now, Easter is just days away. A business that still has Christmas decorations up when spring comes is a business that’s getting a reputation for being disorganized. Your customers are wondering if you just don’t care or if you’ve had to let some of your employees go, so you’re too overwhelmed to take care of this basic task. Which is worse? An apathetic business, or a failing one? Where your reputation is concerned, both are bad. 3) Your ruined signage is still installed. Winter is tough on vinyl banners and yard signs. If you’ve installed a banner and left it up for months while it’s been battered by howling wind and driving sleet, it might be tattered and torn. The H-stakes on your yard signs might be bent over backwards, and you might be missing a few…wait a minute, isn’t that one of your signs laying on the parking lot next to that mitten? The beauty of vinyl banners and yard signs is that they’re inexpensive, so you can replace them after a hard winter (they will last for a few years, though, if you take care to remove and store them before a winter storm). You might be counting on your banner to alert potential customers of your presence. Your yard signs have done a great job of bringing people in for specials and sales. But if your signage is ruined, it’s doing you more harm than good (we wrote a whole article on this topic… you can read it here). Don’t let ruined signage harm your reputation; replace those tattered banners with some bright, shiny new ones. 4) Your store is still full of winter clearance items. What percentage of your inventory is dedicated to those winter items that no one wanted when the snow was actually still falling? If you have just one little rack in the back of the store, you’re probably OK. But if half the store is still full of clearance racks with huge “Winter Clearance!” signs, you’re hurting your reputation. Your customers are so excited about spring that they’re wearing flip-flops and shorts, even though it’s only 50 degrees outside. Do you suppose they’re at all interested in your 80% off parkas and snow boots at this point? A few bargain shoppers might want to peruse your racks, but most shoppers are poking their heads in the door, seeing little or no spring merchandise, and leaving. You want to have a reputation for being the business to go to for the latest stuff. Right now, the latest stuff includes more of those flip-flops and shorts. Ditch the parkas and boots—either put them in storage for next year, or donate them to charity. 5) Your store is dirty and cluttered. There’s a reason that generations of housewives (and now husbands, too!) have gathered cleaning supplies, donned rubber gloves and scrubbed the house every spring. Once that bright, spring sunshine streams through your windows (which also need, to be cleaned, by the way), you can clearly see all the cobwebs and dusty spots that you’ve overlooked all winter. Even if you’ve been pretty thorough with basic housekeeping in your business, it’s still a good idea to do some spring cleaning tasks. Clean your carpeting. Take down light fixture coverings and dump all the dead bugs out of them, then give ‘em a dunk in some sudsy water. Wipe down your walls, shelves and racks. The other major spring cleaning project for homeowners is getting rid of all the junk in their closets and garage. You should do the same for your business. Clean out the back room—if you haven’t used it during the last 12 months, get rid of it. Throw out any broken or wonky equipment, racks, hangers, chairs, etc. If you haven’t fixed them yet, you probably never will. De-clutter and clean your business and you’ll be left with a sparkling, shiny, organized space. When you properly maintain your business, inside and out, your customers will focus on your products and services instead of your flaws. Now’s your chance to shine. Dazzle your spring-fevered customers with stellar service. Bring in new customers with your fresh, fabulous new signage. Offer shoppers the latest in exciting new spring merchandise. And when you go home for the evening, throw on some flip-flops and a pair of shorts, sit on the porch and admire your budding tulips.